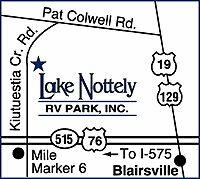 Lake Nottely RV Park is located 2.2 miles west of Blairsville, off of US Highway 515. Turn north on Kiutuestia Creek Road. The park is 1.1 miles north on the right.